On Saturday 23 February our taste buds were titillated by the culinary skills of our talented vicar. Thanks to Chris for a most entertaining evening (it is quite a challenge to cook and crack jokes at the same time! ), and to Sarah for her support, sous chef skills, and hard work behind the scenes. £637 were raised for church funds. Artist Terry Townson has captured Tavistock in a beautifully designed A3 picture map, with limited edition prints and cards on sale in aid of St Eustachius’ Parish Church. Produced in watercolours and pen and ink, the map shows historic landmarks, including the church, the town hall and St Francis Drake’s statue, besides lesser known ones, among them St John’s holy well, a Devon World Heritage window in the town hall and the Honour Oak, which marked the boundary of parole for French Prisoners during the Napoleonic War. The map also features items of personal appeal to Terry, bird boxes, mallards, swifts, buzzards and Devon bluebells, to name a few. Londoner Terry (pictured with St Eustachius’ vicar, Chris Hardwick) moved down country to Gunnislake in the Eighties and then Tavistock last year. 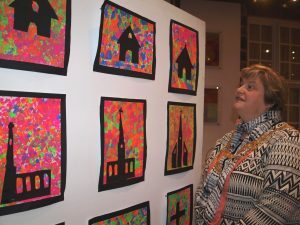 She was inspired by a map she had done previously for Sidmouth Parish Church in 2009, with sales of prints and cards proving a great success. Designing the map was no easy task. Having consulted books by the town’s historians, including Gerry Woodcock and Simon Dell, she found she had more than enough material. Terry’s signed and mounted prints and cards are available at St Eustachius’ Church Friday coffee mornings, Tavistock Museum, the Bedford Hotel, Bookstop and other shops in the town. Charity donations totalling £5,313.47 were gratefully received from Tavistock Co-op by Chris Hardwick and the Parish Giving Officer, David Parkin, at a presentation ceremony, on Saturday, November 24. 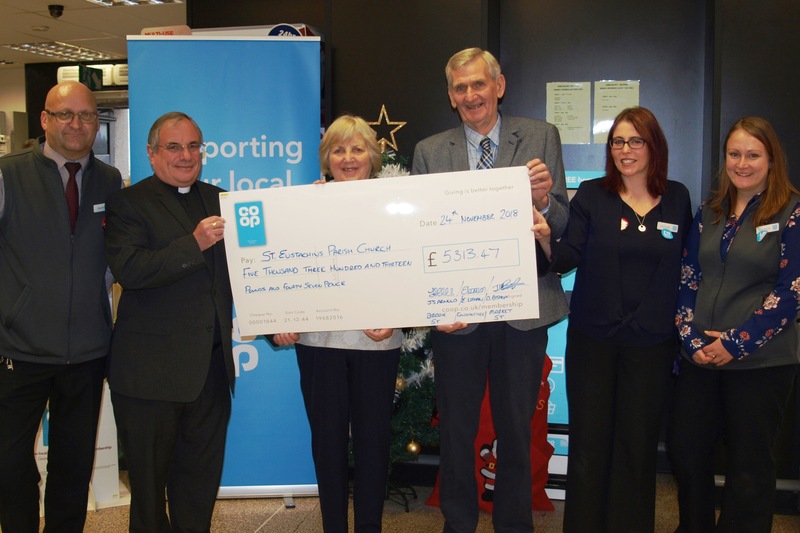 St Eustachius’ was one of the Co-op’s chosen charities for the year and the Church would like to say a big thank-you to the Co-op for their generosity and also to their members who signed up to the scheme in order that the church could receive the benefit of their purchases. With the constant pressure of costs such donations are invaluable and greatly appreciated. Again many thanks to all concerned. Parish Church’s 48th Xmas Bazaar, thanks to Ruby! STALLHOLDER Ruby Ditcher, who started Tavistock Parish Church’s annual Xmas Bazaar 48 years ago, is still playing an active part – helping man the jewellery and accessories stall at Saturday’s event at the town hall. The day proved a huge success, swelling the Xmas Bazaar Fund (which includes Friendly Fridays coffee mornings) by £5,730, towards church funds. 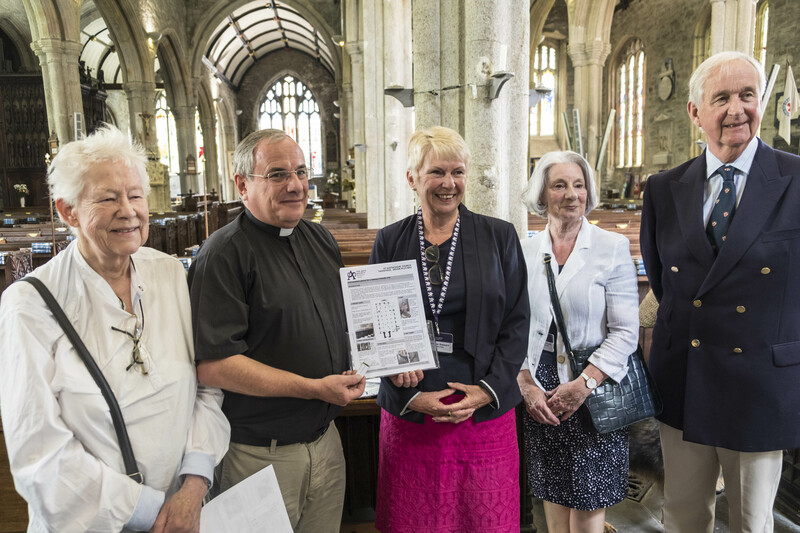 PHOTO: Ruby Ditcher, left, with Tavistock mayor and mayoress, Councillor Paul and Jane Ward, and St Eustachius’ Church vicar Chris Hardwick and his wife Sarah. CRAFTERS at Tavistock Parish Church are lighting the way for Christmas gift ideas. Church candle wax used for cup and saucer novelties are among an array of items they are busy recycling for St Eustachius’ Bazaar at the town hall, which was held on Saturday 17 November. Knitters Janet Kennerley and Ruth Glanville are in the craft group which meets in the parish centre fortnightly on Wednesday afternoons to stitch over cups of tea. The knitters regularly run a stall at St Eustachius’ ‘Friendly Fridays’ coffee mornings and so far this year have raised £635 for church funds. Janet, a chorister, and Ruth also sell cards they make from recycled ones, following Sunday morning services. Congratulations to the team who achieved a full peal of 5039 changes of Grandsire Caters this afternoon, Sunday 11 November 2018. It took exactly 3 hours and 20 minutes. The peal was rung to commemorate the ending of the First World War, 100 years ago, and to celebrate the 700th anniversary of St Eustachius’ church. 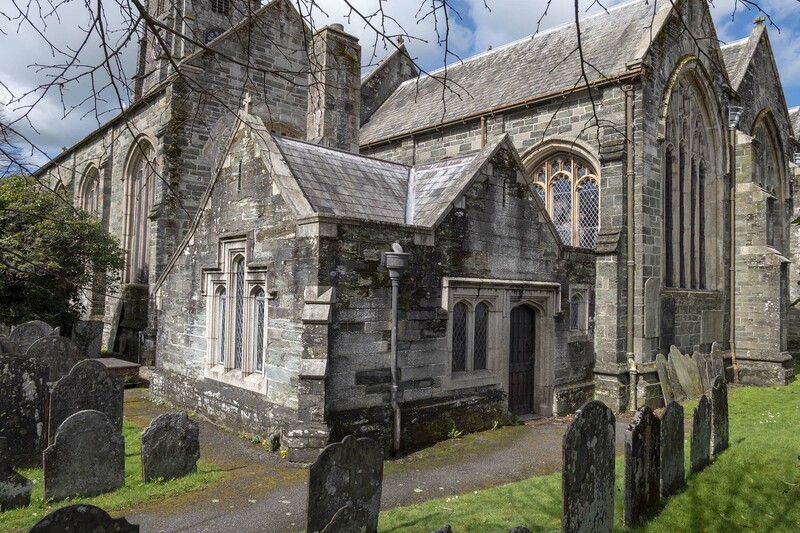 Those who supported Tavistock Parish Church’s Sponsor a Slate campaign helped to raise a fantastic £17,000 towards re-roofing the church vestry, enabling the work to be completed before winter. 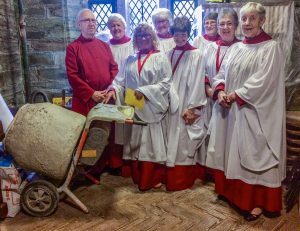 The roof had been leaking for some time and, with last winter being so wet, restoration work was urgently needed to prevent further damage to choir robes, music and other essential worship items stored inside. The anticipated cost was a staggering £84,000, but The Friends of St Eustachius’ agreed to underwrite up to half the cost, which enabled the work to begin. However there was still a considerable shortfall, and in the spring the idea of sponsoring a slate campaign was launched, inspired by a similar project at Truro Cathedral. 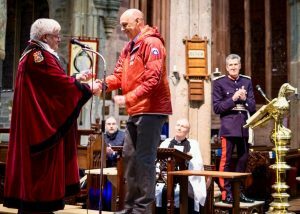 It was led by Plymouth resident, Tom Smith, who offered to take the reins after an appeal was made at a church service. Individuals, families and groups were invited to sponsor and sign a slate, or part of one, donating up to £25 for each – and the community rose to the occasion admirably. The work was finally completed in August. Now all sponsors can walk past the vestry, assured that their slates are not only keeping out the weather, but their signatures beneath are part of a time capsule which in years to come will reveal who helped to make the restoration work possible. People’s generosity is also recorded in a book kept in the vestry. The project, which started in April, overran by several weeks because of unforeseen building problems. After work began it was discovered that the vestry roof adjoining the mid-19th century church sacristry was leaking because of deterioration in the mortar between the granite coping and the top of the walls (built of locally quarried Hurdwick stone). Also, there was no damp proof course between the walls and timber roof trusses, which had caused rot. The extra work added another £9,500 to the bill. Additionally unforeseen in the planning was the extension of the roof chimney in readiness for a replacement (condensing) boiler as part of a new central heating system proposed for the church. Under canon law this required a church faculty. CEMENTING WORSHIP: Labouring under certain difficulties during the vestry roof restoration, members of St Eustachius’ Church choir welcome the presence of a cement mixer in the corner as they practise for morning service. The choristers are happy to share their home with building site equipment in the knowledge that (hopefully) when the repair work is completed, their robes will still be wearable for worship! Another First for Tavistock in Dementia Action week! 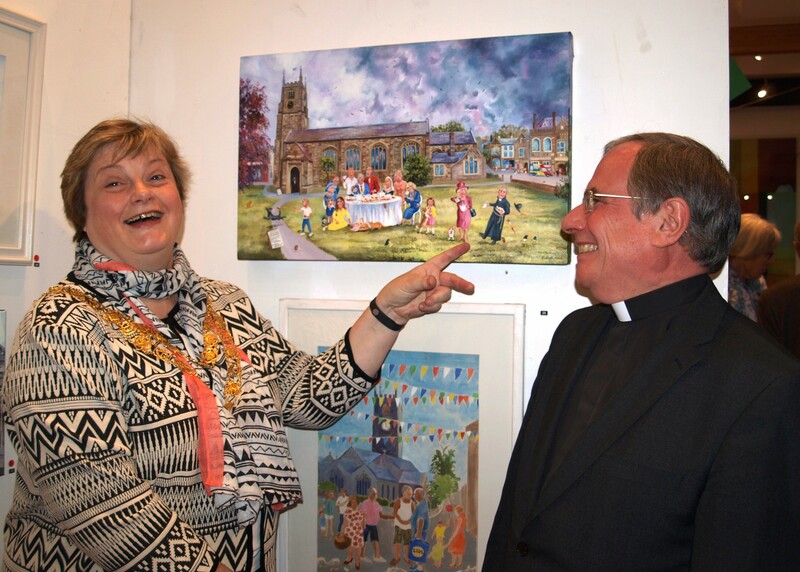 On Friday 25 May, Pauline Stewart, National Chair of the Arts Society Church Trails Group opened the first Church Trail in the country at St Eustachius Parish Church by presenting a copy to the Very Reverend Dr Chris Hardwick. This is a Trail around the church which has been specially written for use by those living with dementia with their carers and is intended as a way of stimulating memory and making outings to the church more interesting for them. Members representing the Arts Society were present when some members of Tavistock Memory Café put the trail into use for some of their members who enjoyed the experience. 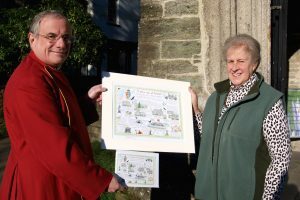 The concept was created by Tim Jones of Wadebridge on behalf of the Arts Society and it is hoped that this template will be used to create many other Church Trails throughout the country in the future. 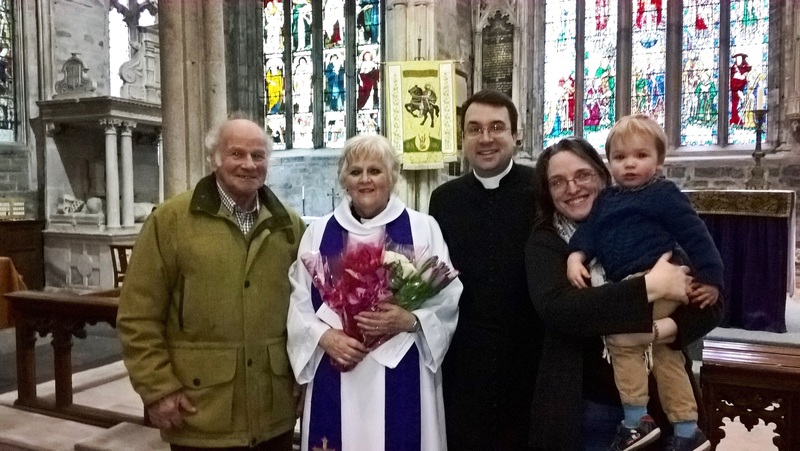 MOTHERING Sunday was cause for double celebration at St Eustachius’ Church as the Reverend Sue Tucker was presented with a bouquet of flowers for her 70th birthday following a joyful service which she led. Reverend Sue delighted adults and children alike conducting her sermon from her ironing board and the occasion was particularly poignant as she is a mother of two children, three step-children, two grandchildren, 11 step grandchildren and a great-grandchild. 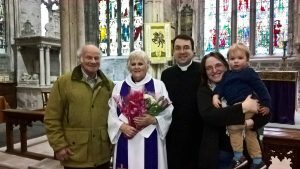 Sue, assistant curate, is pictured after the service with husband Roy, assistant curate, the Reverend Dr Steven Martin, and his wife, Caroline, with son, Henry. A special service to mark the 50th anniversary of Dartmoor Search and Rescue (Tavistock) was held at St Eustachius’ Church on 25 January. Led by the Reverend Andy Barton, it was attended by more than 250 people from across Devon and was the team’s first celebratory event of the year. Town mayor, Councillor Philip Sanders, presented a plaque via the team’s deputy Pete Swaine, marking the town’s gratitude for the team’s service. 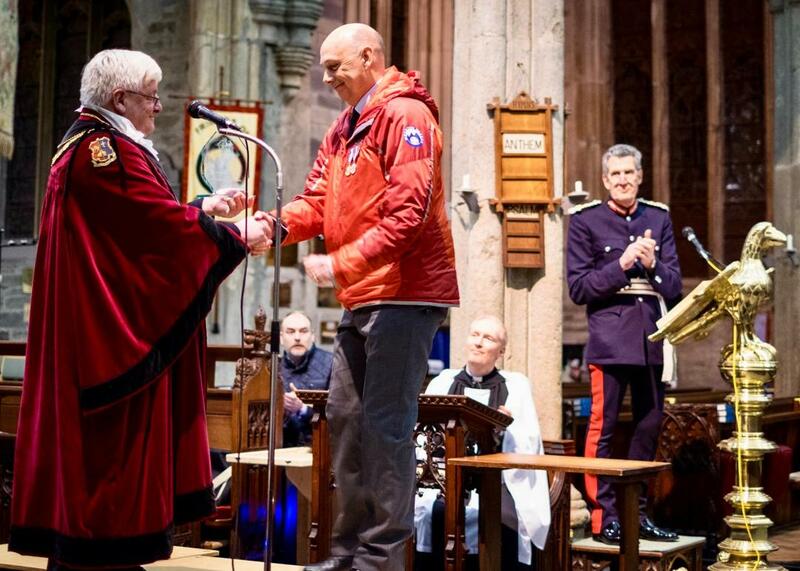 The team also received the tungsten award for 50 years of support to Ten Tors. Team chairman, Rhod Davey, led the celebrations, telling the team’s story over the years. Members exhibited their kit and the congregation watched the first public viewing of the team’s new film. Refreshments were provided by the Friends of St Eustachius. 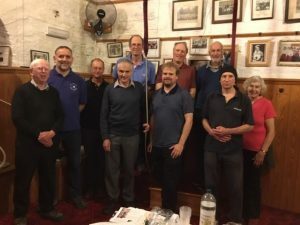 HEAD of St Eustachius’ fabric team, Nick Clark, plays two vital roles in the community – maintaining the 700-year-old building, and finding missing people as a volunteer with Dartmoor Search and Rescue. Nick oversees seven volunteers, who turn their hand to everything from clearing leaves from the roof and replacing light bulbs, to erecting Christmas trees for the December festival and the stage for last year’s Passion Play. For greater tasks, such as the re-roofing of the vestry in the spring, they oversee local contractors. 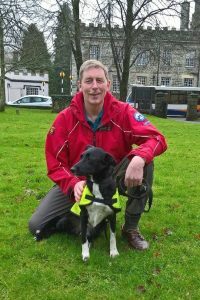 Away from the demands of the church, Nick spends many hours each week training with his Collie, Jess, and since qualifying for Dartmoor Search and Rescue two years ago, has attended 58 call-outs. He is also secretary of the team, and sometimes his commitments can mean seven days a week. 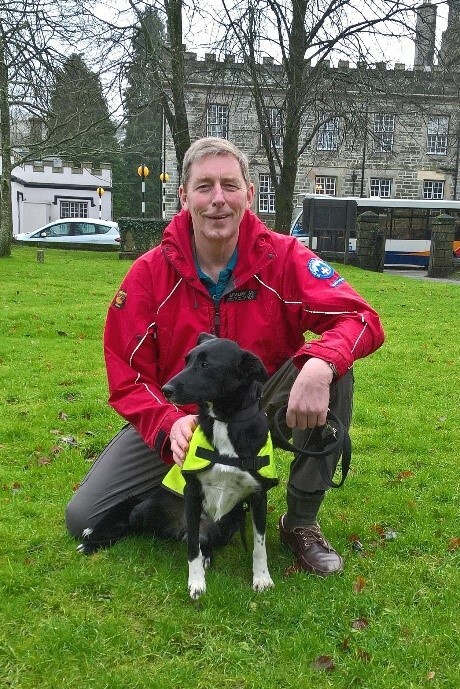 Nick, 58, is more often seen at Sunday Evensong because during the day he and Jess spend four hours training with other dog handlers from the South West Region. 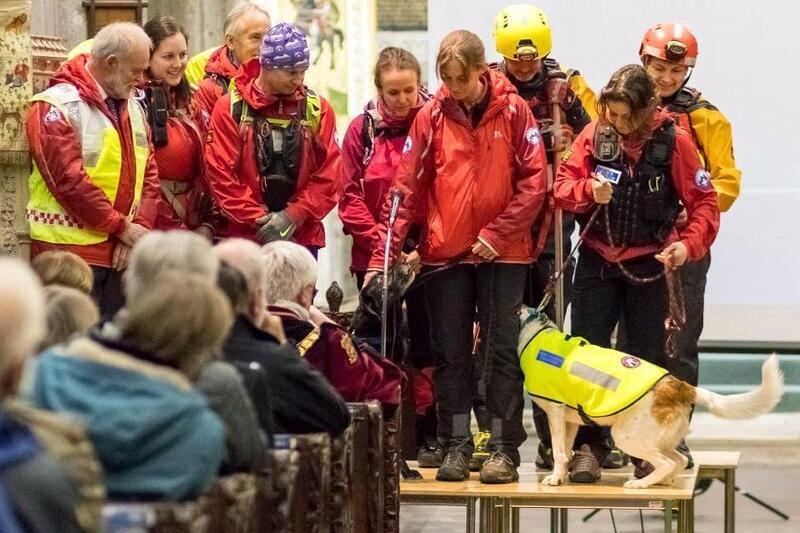 Once a month they travel to different parts of the country to further their skills with the Search and Rescue Dogs Association (SARDA), their most recent in the Lake District. On Thursday mornings, too, a friend acts as a body for Jess to find. He recalled a near midnight call-out last July, when a man in his 50s had gone missing after leaving a note. His car had been found at Two Bridges and five searchers spread out at regular intervals. Eventually, the team navigator in the centre position spotted a figure at Littaford Tor. Nick, as Casualty Carer, called in the team leader, using a priority radio message, and assessed the man, who had numerous cut to his wrists. With him was an empty bottle of scotch and two empty pill packs. Nick then called team Welfare Officer, Andy Barton, who is also a chaplain at Derriford Hospital, to attend the man’s emotional distress whilst he concentrated on the man’s medical condition. The man was then taken to hospital. To qualify in mountain rescue Nick’s experience more than fits the bill. He was in the Royal Engineers, serving in many countries including Afghanistan, Iraq, Kuwait, Bosnia, Macedonia and Northern Ireland. For eight years he was in bomb disposal. He explained: ‘After the Brighton bomb in 1984 Margaret Thatcher instructed that the army should teach police forces all they knew about searching for bombs in Northern Ireland. I was tasked with forming the first joint Military and Police Search Training Team, which has grown over the years to become the Police National Search Centre’. *St Eustachius’ Church’s fabric team meets regularly on Monday mornings and welcome more volunteers. If you are interested please contact the Parish Office on 01822-616673. TWO live nativity services are to be held at St Eustachius’ Parish Church, Tavistock, on Christmas Eve at 4 pm and 6 pm, such is their popularity. There will be the journey to Bethlehem with Mary and Joseph and the donkey, the arrival at the inn, Jesus’ birth in the stable, the angelic host and the shepherds with their sheep. THE ninth annual Christmas Tree Festival at Tavistock Parish Church opens on Friday 1 December with 65 trees decorated by local groups, businesses and organisations. The trees will be all aglow for the launch of St Eustachius’ Church’s 700th anniversary celebrations at its Advent Carol Service, at 6 pm on Sunday 3 December. The ten-day festival, which begins the night of the town’s Dickensian Evening, will be opened by Tavistock mayor, Councillor Philip Sanders. As usual, thousands of people are expected to view the spectacular. 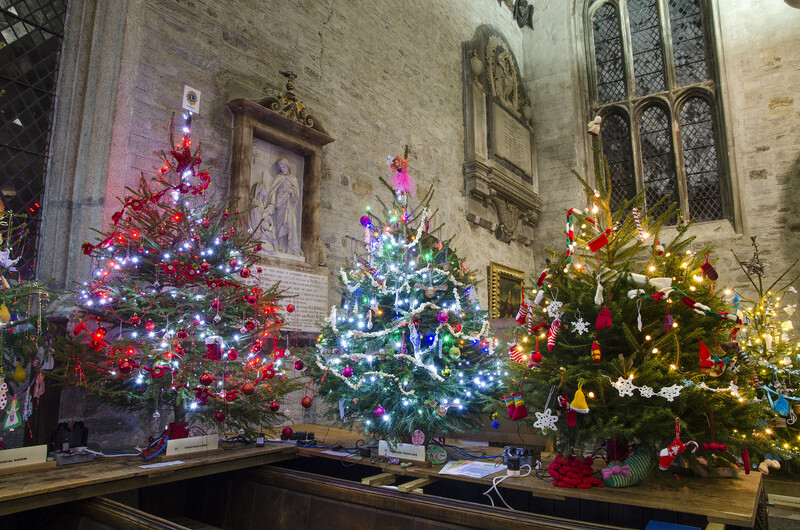 Since the festival opened in 2008, nearly 70,000 visitors have viewed more than 450 trees, decorated by nearly 200 different local organisations and £77,000 has been raised towards the church’s upkeep. The event will include music, stalls selling festive wares, coffee, teas and cakes and soup and toasted sandwich lunches. The festival, which runs until Sunday 10 December will be open from 10 am to 4.30 pm daily, except Wednesday 11.30 am to 6.30 pm and Sundays, after services. KNITTER Nichola Heathman has her hands full making stocking fillers for a new stall at Tavistock Parish Church’s Christmas Bazaar, on Saturday 18 November. She is one of several church members busy knitting festive items to hang on the tree or play with as finger puppets. 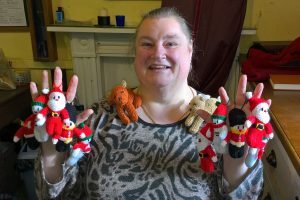 Since August she has made 40, which include Santas, snowmen, soldiers, dogs and teddies. 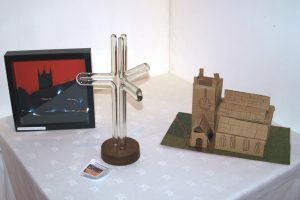 Nichola is a Sacristan at St Eustachius’ Church and among her creations is a collection of figures representing the Last Supper, used by the children’s Vestry Group. The church’s 43rd annual bazaar will be opened by Tavistock Mayor, Councillor Philip Sanders, at 10.30 am. A variety of stalls will sell everything from cakes, free trade goods, toiletries and crafts, to good quality clothing, bric-a-brac, paintings, puzzles, toys and games. Other attractions will include the ever popular Vicar’s Whisky raffle, which is held every half an hour, tombola and a guess the name of “The Traveller” competition. A local artist’s painting of the church will also be raffled. 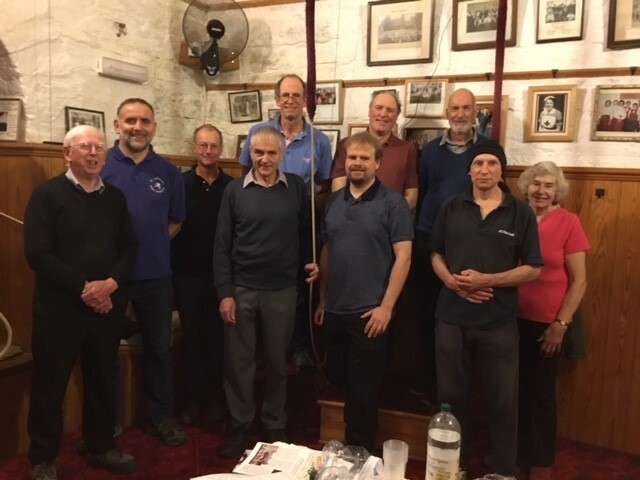 At 2 pm hand bell ringers will perform in the parish hall, which is across Plymouth Road. Proceeds are for the fabric of the church, which celebrates its 700th anniversary in 2018. 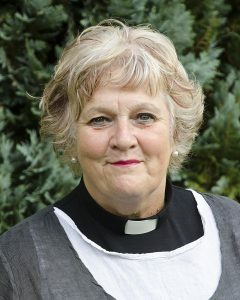 DAIRY farmer’s wife Judith Blowey, from Gulworthy, was ordained deacon at Exeter Cathedral, last Sunday (September 10th). Judith, who will be serving as an assistant curate in the Benefice of Tavistock, Gulworthy and Brent Tor, was one of 14 Ordinands to be licensed at a special service by Bishop Robert. For the occasion Judith was joined by members of her church, St Eustachius, Tavistock, and Brentor Church. At Tavistock Parish Church’s Evensong, Judith was warmly welcomed to the benefice by the Very Rev Dr Christopher Hardwick, who presented her with a stole from Gulworthy church members, whose collection will also contribute towards a Home Communion set. Judith has been a member of the Church all her life, serving both as a Sunday school teacher and Parochial Church Council secretary. She was originally a member of St Mary’s Church, Brixton, near Plymouth, where she was born, moving to Gulworthy in 1983. Initially, she had to go through a discernment process and then face an advisory panel. Once accepted, she began her journey to the priesthood with South West Ministry Training and has another year’s work before achieving her goal. ‘Being under the supervision of Chris Hardwick is a huge privilege and I welcome also the experience and support of the ministry team, which includes deacon the Rev Sue Tucker, being ordained priest later this month. In more earthly matters Judith works on the farm with husband Peter, their son, Philip and daughter-in-law Sally and runs a B and B. The couple also have a daughter, Helen, son-in-law Dave and three grandchildren. An appeal has been made to the community to help secure the future of Tavistock Parish Church as it prepares to celebrate its 700th anniversary next year. Vicar, the Very Reverend Dr Christopher Hardwick, speaking at a buffet supper attended by 150 guests at the town hall on Friday 14 July, said: ‘Moving forward we face a challenge. Last year it cost the church £174,000 to do all that we did, but with total income of £155,000 a year, we have a funding gap. It is a shortfall of £19,000 a year –that is £365 every week, nearly £52 every day. ‘We are entirely self-financing and receive no financial support from the government, or the national church, or from endowments, and so we are looking as a matter of urgency to bridge that gap’. The supper, to launch a new programme for St Eustachius’ called “The Way Ahead – Supporting Your Parish Church”, included a sit-down meal, slideshow, musical entertainment by the choir and vocal and piano duo Gin and Pimms, plus guest speaker, Canon Dr John Rea. James Teague gave an overview of finances and Katie Stevenson spoke about the Community Giving Scheme. Dr Hardwick said church organisers were optimistic about the future and funds were already set aside for the first phase of the 700th Anniversary project; to make the vestry roof watertight. He also outlined aims for a longer term re-ordering plan, which include the provision of a new galley and toilets and an improved heating, electrical and sound system; enhancing the church’s musical provision through a new chorister/organ scholarship scheme; an enhanced programme of concerts and events; re-instating access to the church via the tower using landscaping and a lych-gate to “re-connect” the church to West Street. James Teague, a Tavistock businessman, said: ‘This is about building a community. It’s about everybody. I am not a religious person and am not part of the worship – I don’t come from a religious sect at all. I have been working with St Eustachius’ for some years helping to optimise our income – our finances are under control as much as they can possibly be. Anyone wishing to support St Eustachius’ Church is invited to contact the Parish Office on 01822-61667, email parishoffice@tavychurch.eclipse.co.uk or view more details at the church. 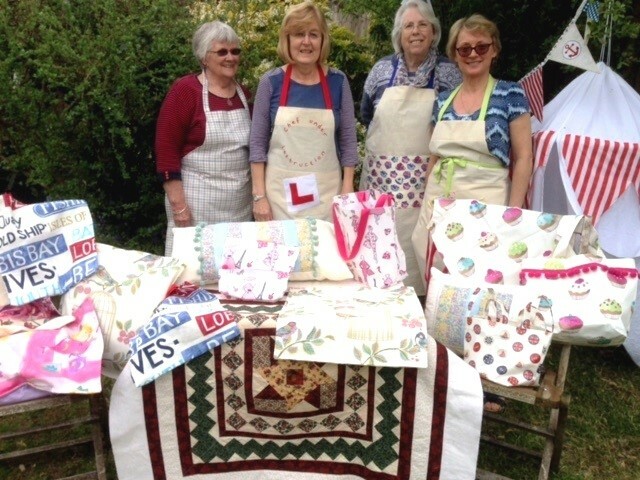 A GROUP of crafty recyclers are ‘sew busy’ making quality items for Tavistock Parish Church’s summer fete next month – while helping to save the planet! 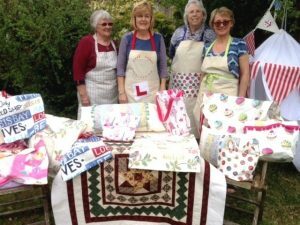 Calling themselves Vintage Green, they use old, unwanted and donated materials to make anything from quilts, cushions and aprons, to bags, cards and craft gifts. 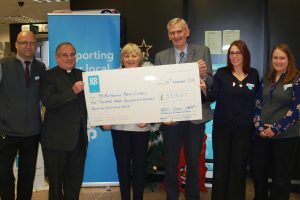 Since joining forces four years ago they have raised over £5,000 for St Eustachius’ Church and hope to add another good sum from their next stall. With years of experience between them, the crafters have all the makings of a successful ‘church family’ business, spending much of their spare time in production. One of five members, Sarah Pendle said by using recycled, old and unwanted items from the environment, the group was supporting the church and God’s creation. Sparking off each other, they make the best possible use of whatever items come into their hands, creating anything from tepees and circus play tents, to scented candles and cards. Hilary Sanders describes the group as ‘very supportive, sharing fun and friendship and inspiring other people’. 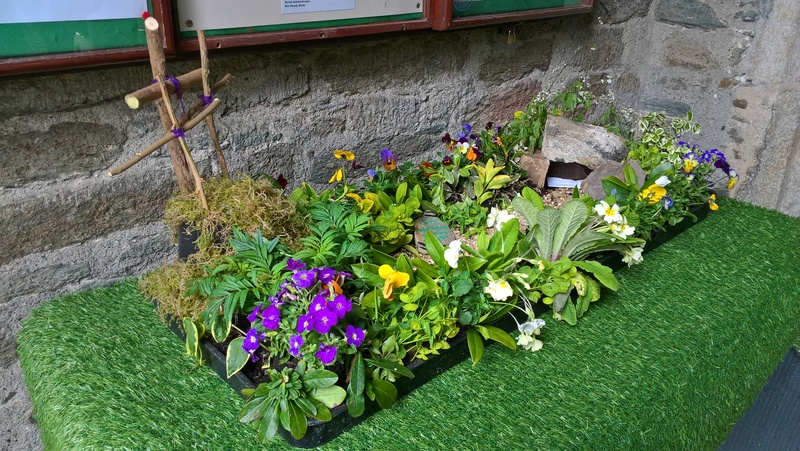 Vintage Green, started in 2014, is a splinter group of the Church Green Team, which gained an Eco-Congregation Award for being environmentally friendly by developing better ways to use resources. Besides the summer fete the group usually has a stall at St Eustachius’ Christmas Tree Festival and in the run-up to these two big events the sewing ladies spend ‘countless hours’ adding to their stock. View their latest range at the fete on Saturday, June 10, from 10.30am to 3.30pm. Other stalls will include woodturning by Eric Cockings, handicrafts, bric-a-brac, nearly new clothes, books and plants. There will be a bouncy castle, face painting, entertainment from Flute Ensemble and The Saxophonics, plus church tower tours, a barbecue and refreshments. Sarah Pendle, who runs the group, said since the groups’ launch, 13 sessions had been held, including three summer ones (“Mini Messy”) and a Saturday one. Sessions include the parables of Jesus, Creation, the Bible, Mountains, Joshua, Christmas and Easter. Worship is led by vicar Chris, assistant curate Steve Martin and Sally Pancheri. She thanked the PCC for funding the group and all supporters. Families are welcome to just turn up at any “Messy Church” session, usually held the first Wednesday of the month. The next one is on June 7, 3.30pm to 5.30pm. 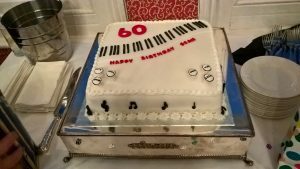 Choristers from St Eustachius’ Church toasted Sean Sweeney’s 60th birthday with a surprise celebration at The Bedford Hotel, following their practice on Friday April 28. Sean was presented with gifts including a bottle of wine, wine glasses, flowers and a birthday card picturing a church organ, specially embroidere d by chorister Rita Bilverstone. A birthday cake, iced with a keyboard and music notes, was made by Gulworthy resident Hilary Barnardo, and assisting Sean with the cutting was his wife, Carol. On Sunday April 30, Sean, Director of Music at St Eustachius’ since 2005, led a joint choral evensong with the Cornish choir, Canoryon Lowen, as part of Tavistock Festival 2017. 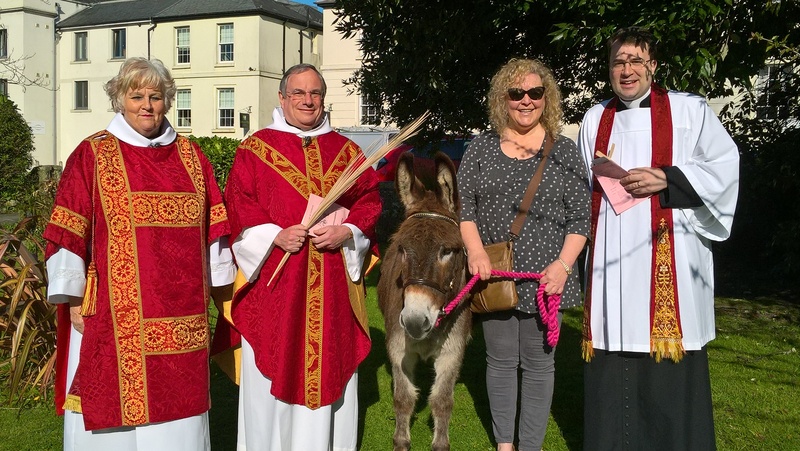 TAKING a leading role in Palm Sunday’s procession from the parish centre to St Eustachius’ Church was Arthur the donkey, who duly trotted in once again to take Jesus into Jerusalem for the Tavistock Passion Play on Good Friday morning. Also pictured are the vicar, The Very Reverend Dr Christopher Hardwick, assistant curates the Reverend Dr Steven Martin and The Reverend Sue Tucker, with Arthur’s owner, Heather King from Tavistock. Palm Sunday followers, clutching ‘palms’, accompanied the choir singing, All Glory, Laud and Honour as they circled the church before entering for the service. 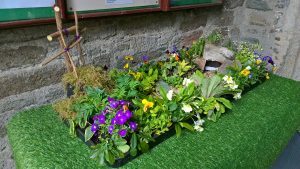 Also featured below is an Easter Garden in the church porch made by the members of the Vestry Group. On Saturday 10 December the Chicks Santa Run took place – over 250 ‘Santas’ came to Tavistock to take part – from babies in prams to … Eileen Hooper, who was the oldest competitor. Well done Eileen – we are very proud of you. The weather was poor but it did not put a dampener on the Run. 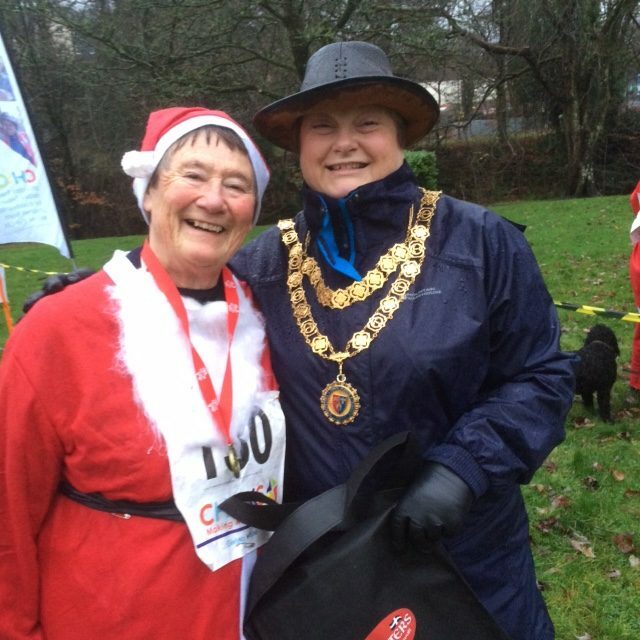 Eileen is seen being presented with her medal by the Mayor, Councillor Mandy Ewings. Festive Tree-t at St Eustachius! THE focal point of Tavistock’s Dickensian Evening on Friday 25 November, will be St Eustachius Church, glowing with festive cheer on the opening of its annual Christmas Tree Festival. Exhibitors, including traders, schools, groups and organisations, are busy putting final touches to their trees ready for the event opening at 6 pm. This year there are several new participants, including Morrisons, Boots Opticians, Broadley Speaking, the Town Hall, Tavistock Times, besides many old favourites such as Goosey Quilters, the Flower Club and the Turners and Carvers Club. In response to requests last year, on Wednesday 30 November the church is staying open late (until 6.30 pm), a new departure. Mulled wine will be on sale and carols fill the air as the choir practices its Advent Carol Service, being held on Sunday 27 December at 6 pm. The ten-day spectacular, running until 4 December, attracts visitors from far and wide. Last year more than 10,000 people walked the tree-lined aisles and over £12,500 was raised towards church funds. For more information on the Festival opening times, please see the main page of this website under ‘Friends’. CHORISTER Eric Cockings, who sold wooden gifts, at the Christmas Bazaar on 19 November, that he had made from St Eustachius’ old church doors, helped to raise the record-breaking sum of £5,073. 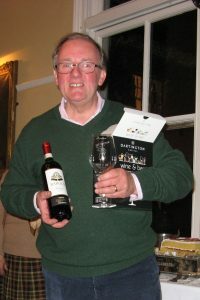 The event was at Tavistock Town Hall and Eric alone took over £1,000, with some 50 orders to follow. The doors, believed to be two to three hundred years old, were replaced two years ago, and with no plans for them, Eric was permitted to rescue them for St Eustachius’ benefit. 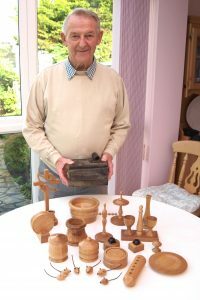 Eric has crafted everything from bowls, pots and coasters, to pencil holders, egg cups and jewellery stands. His paperweights he inset with cast iron studs from the church doors. Born and bred in Ivybridge, Eric and his wife Sylvia, moved to Tavistock in 2000, and a few years later both joined the church choir. Eric, a chorister since he was eight, met his wife Sylvia, in the choir at Ivybridge when he was 16 and she 14. They have been married 58 years and still enjoy singing together as tenor and alto. 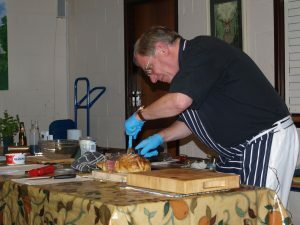 Eric is a founder member of Tavistock Turners and Carvers Club, and now president. ARTISTS from primary school age to talented amateurs and professionals attracted a steady flow of visitors to St Eustachius Church’s Art Exhibition in Gallery 26 at the Bedford Hotel, on Friday and Saturday, October 7th and 8th. 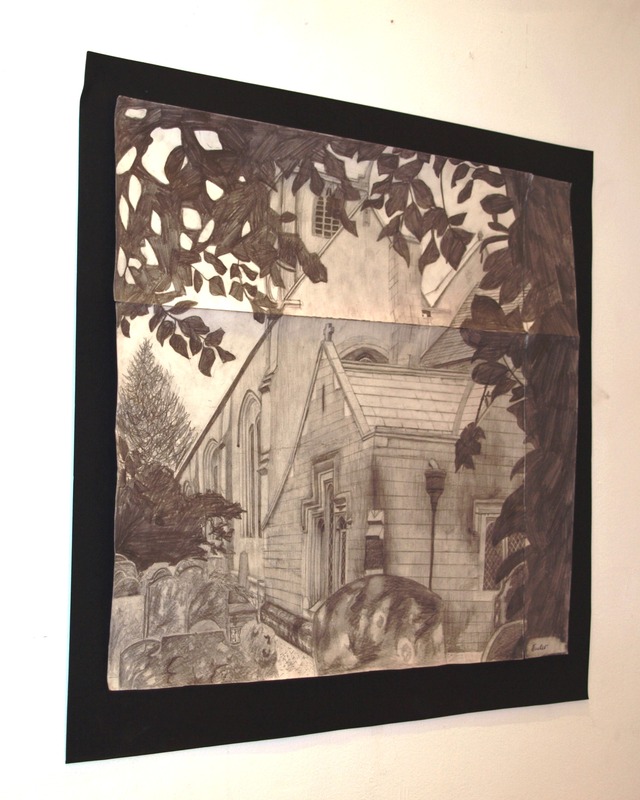 Entrants were asked to create a picture or artwork of Tavistock Parish Church, or any part of it. Exhibits included everything from watercolour, gouache and oil, to acrylic, pencil and pastel. Among other work were monoprints, fabric and illuminated pictures and customised glass. The scho ols competition was run by Hugh Walkington, with entries from Lamerton Church of England Primary, Mount Kelly Preparatory and Senior schools, St Peter’s C of E, Tavistock College and Whitchurch Community Primary School. These were judged by a panel of well-known local artists, including Nick Collier, Ian Pethers and Ros Pierson. Prizes were awarded to: Alice Tucker (Tavistock College), Rick de Wilde (Lamerton C of E), Annabelle Hess and Charlotte Tilney (Mount Kelly Prep), with another 19 children receiving certificates of commendation. Visitors were asked to vote for their favourite picture and chose Colin Hale’s oil painting of floodlit St Eustachius, entitled ‘Night Light’. The event is the first to be organised by The Friends of Eustachius in the run-up to the church’s 700th centenary in 2018, with plans underway to help attract a wider community to the church. Chairman of The Friends, John Rea organised the event, ably assisted by Judy Hirst, deputy chairman. 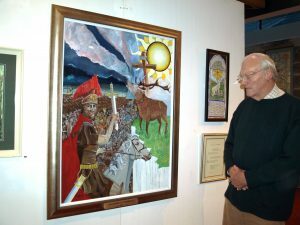 John said: ‘The exhibition was seen by many people and was a great success. A big thank you to artists young and old, who contributed beautiful works of art’. Vicar Chris Hardwick said: ‘A big thank you to all The Friends who made this possible and everyone who contributed. This is all part of building for the future in which we hope to engage more widely with our Christian community in the Tavistock area, where we have been for several hundred years and longer’. A proportion of money raised from the sale of exhibits is being donated to the church’s upkeep. 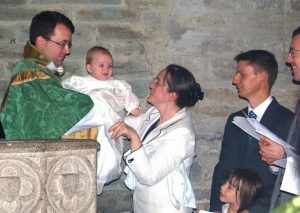 THE day after being ordained priest at Tavistock Church, the Rev Dr Steven Martin baptised his son during his first Eucharist service. Steven was ordained by Bishop Nick of Plymouth, on September 24, together with Carl Budden, from St Edward, Eggbuckland, and Leon Catallo, of St Andrew and St Paul, Plymouth. St Eustachius Church was packed for the event, for which the choir was joined by choristers from the Collegiate Church of the Holy Cross and The Mother of Him Who Hung Thereon, Crediton, where Steven had formally been Director of Music. The following day, he presided over the Eucharist for the first time and christened his son Henry George Buxton. For this service, choristers from Steven’s Taunton choir, In Ecclesia, swelled the choral ranks. Steven is pictured with his wife, Caroline, after Henry was clothed in The White Garment, which represented being clothed with Christ. The gown was made from Caroline’s wedding dress by churchwarden, Hilary Sanders. After the service Steven returned to the High Altar to give First Blessings to those wishing to receive one. In this ancient tradition, the newly anointed hands of the priest (sanctified by the Holy Spirit through the bishop with the holy Oil of Chrism) are used to give God’s blessing for the first time. Steven, an accomplished musician, chose hymns and anthems for the services. His love of church music stems from his childhood, when he joined the choir at St George’s Metropolitan Cathedral, Southwark, aged eight. He progressed to learning the organ and at Tavistock occasionally supports Director of Music, Sean Sweeney and the choir. He studied music at Exeter and Bristol universities, was a choral scholar at Exeter Cathedral and led choirs in Exeter and Taunton. His organ playing pursuits include Broadhembury, Payhembury, Crediton and Exeter Prison (as a visitor!). Steven began to feel a call to the priesthood while at St George’s cathedral, initially exploring his vocation at secondary school. He vividly remembers his interview with the careers advisor. ‘When I told her that I wished to become a priest, I am not sure that she quite knew what to say or recommend, so she telephoned Lambeth Palace and I remember her passing the receiver to me and speaking to a nice gentleman – not the Archbishop I think! – and he asked me what I was interested in. He recommended that I focus on music for a bit, as I seemed to be enjoying that, and then I could go forward for selection. Steven, assistant curate at Tavistock Church, will perform his priestly duties in the benefice of St Eustachius, St Paul, Gulworthy and Christ Church and St Michael de Rupe, Brent Tor. He said: ‘Tavistock is an excellent place and Caroline and I love being here. We have been overwhelmed by the warm welcome and support we have received since our arrival just over a year ago. Our heartfelt thanks to all who attended the services and for all the good wishes and messages of support we have received’. NEWLY-ordained Sue Tucker will be a familiar face in Tavistock parish from now on. 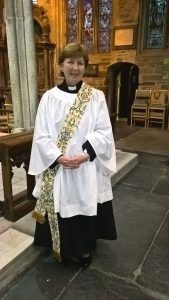 Sue was ordained Deacon to serve as Assistant Curate to the Benefice of St Eustachius, St Paul’s Gulworthy, Christ Church and St Michaels, Brentor, at a special service at Exeter Cathedral last Sunday (September 11). People from the three parishes travelled to Exeter to see her ordained along with 13 other candidates by the Lord Bishop of Exeter, Bishop Robert. That evening, at St Eustachius Church’s evensong service, she was warmly welcomed by the vicar, The Very Reverend Dr Christopher Hardwick, who presented gifts of books and liturgical stoles from the parishes. A celebration party was held afterwards at the parish centre. Sue, who has two children, three step children, 11 grandchildren and one great-grandchild, will be working half-time as self-supporting Assistant Curate in the benefice. Retired herself, she is particularly keen to grow ministry with the elderly, people with dementia and the bereaved. For 24 years Sue worshipped at St Mary the Virgin Church, Bickleigh, in the Benefice of Roborough and 16 years ago was licensed as a Reader. 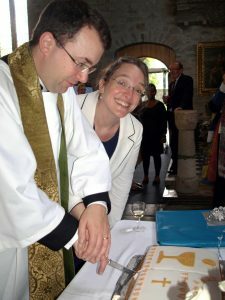 Eight years later she became Rural Officer for the Diocese of Exeter, working closely with rural churches and networking with rural communities and farming organisations. Sue had retired when she was encouraged by the then Bishop of Crediton, Bishop Bob, to become ordained. After a few ups and downs, she spent three months on placement with the West Dartmoor Mission Community and started her training in 2015. It was a steep learning curve, as she had never written an academic essay before, but with great support from parishioners, she managed to pass all her exams. Last Sunday was the culmination of Sue’s calling to ordained ministry. She said: ‘I am delighted to be serving the people of the benefice. I feel this is the place God has called me to be. It is hugely affirming being at St Eustachius, St Paul’s and Christ Church and I pray that together we will all be on a wonderful journey as we truly become disciples of Christ’. 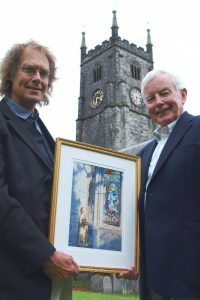 ARTISTS of all ages are being invited to paint a picture of Tavistock’s beautiful parish church, or any part of it, in a summer art competition – and their work will be displayed in an autumn exhibition. The competition is one of the events marking the 700th anniversary of St Eustachius Church in 2018, and the exhibition will be open to the public at the Bedford Hotel, on October 8 and 9. The competition has three sections: Junior (under 13), Senior (13 to 18) and Adults (19 and over) on September 1, with cash prizes for the best entries. To inspire you, artist Ian Pethers, exhibition secretary of Tavistock Group of Artists, is pictured holding a watercolour he painted showing part of the Lady Chapel east window, with a carving of the Virgin and child. Ian, a member of the Hilliard Society of Miniaturist Art and the Royal Miniaturist Society, is pictured with Canon Dr John Rea, chairman of the Friends of St Eustachius Church, which is organising the competition. Schools have been posted with details of the competition. For an entry form please contact John Rea (williamjohnrea2000@yahoo.co.uk; 01822 613420) or Hugh Walkington (hughwalkington@gmail.com; 01822 614972).